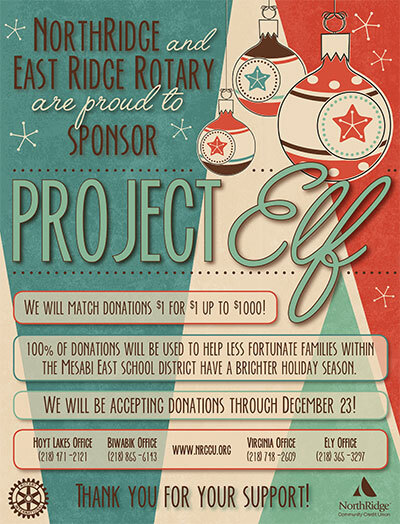 NorthRidge is excited to partner with the East Range Rotary to help raise funds for Mesabi East’s Project Elf this holiday season! We are going to match any donations made at NorthRidge $1 for $1 up to $1000. We will be accepting donations at all four of our locations through December 23rd. Project Elf is a program at Mesabi East where a group of high school students raise money through donations to help less fortunate families within our school district have a brighter holiday season. Last year with the help of our communities, Project Elf was able to help thirty-three families. With the funds raised, the students hope for items on a list of “needs” and “wants” for each child provided by the parents. The program facilitator takes a small group of students to shop for the families. The students are given a budget and purchase the needs of the children first and then with the remaining funds they will get some of the wants on the list. The students do an amazing job of working with the budget they are given and making the decisions that will allow the budget to stretch, giving the children as much as possible. The value of this program is really two fold. We are able to help many of our students receive basic needs that they may have a Christmas time and it also teaches those who volunteer the importance of becoming involved in their community. Project Elf is funded strictly through the generosity of various companies, civic organizations, church groups, and individuals in our communities in the form of monetary donations, gift items, food and other items needed. There is no overhead cost for this program and every donation received goes to the children. Project Elf has been successful by seeing the same students wanting to volunteer each year as well as many new students who want to get involved. Also, we have many who are repeat donors who give generously each year and continue to support this program to ensure its success. The greatest moment is when we have a past recipient become a donor to the program. There is no greater gift than to see it come full circle for some people. NorthRidge is proud to announce three staffing changes. 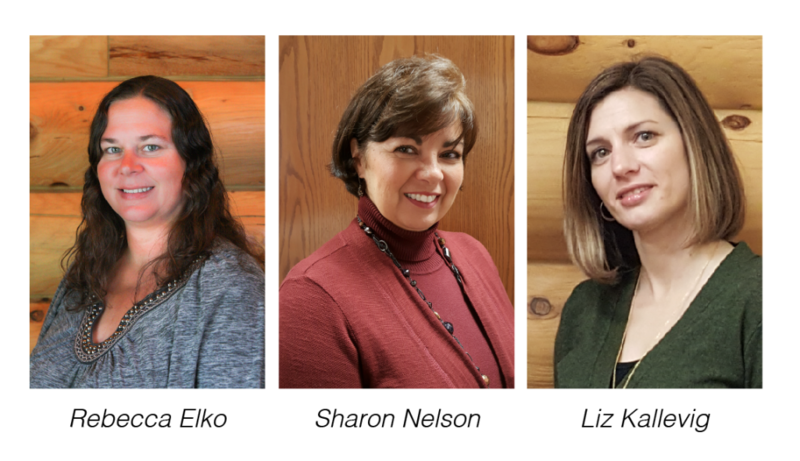 Sharon Nelson is moving to Vice President of Lending, Liz Kallevig is being promoted to Operations Manager and Becky Elko is being promoted to Financial Services Associate. Sharon Nelson has over 25 years of credit union experience with a special concentration in lending. As Vice President of Lending she will oversee consumer lending, real estate lending, commercial lending and will develop new lending products. Liz Kallevig came to NorthRidge in 2006. 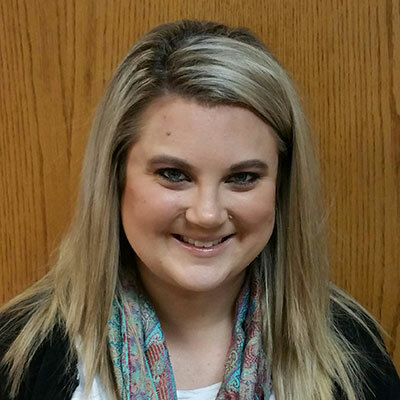 Her main responsibility as Operations Manager will be to oversee deposit operations, develop new programs and services to better our membership, such as the Kasasa Rewards Checking, and to manage the Human Resource functions. Becky Elko has been with NorthRidge since 2005. In her new role as Financial Services Associate she will continue to be an expert in all areas of member products and services. In addition, she will also support our members with all of their consumer lending needs. We continue to expand due to our excellent customer service and performance. To meet the growth needs of their expanding membership, NorthRidge has added two new staff members; Jillian Grivette in the Biwabik branch, and Hannah Dewhurst in the Virginia branch. Jillian started in the Biwabik branch and Hannah started in Virginia in the month of September. NorthRidge is proud to serve the four communities and strives to live up to its philosophy of people helping people. NorthRidge ‘Cram the Desk’ School Supply Drive Was Another Great Success! We held their second annual “Cram The Desk” School Supply Drive during the month of August to give aid to hard-working families having trouble making ends meet. Throughout the month, NorthRidge gathered over $300 in school supplies that will help area children in need to start the school year off right. 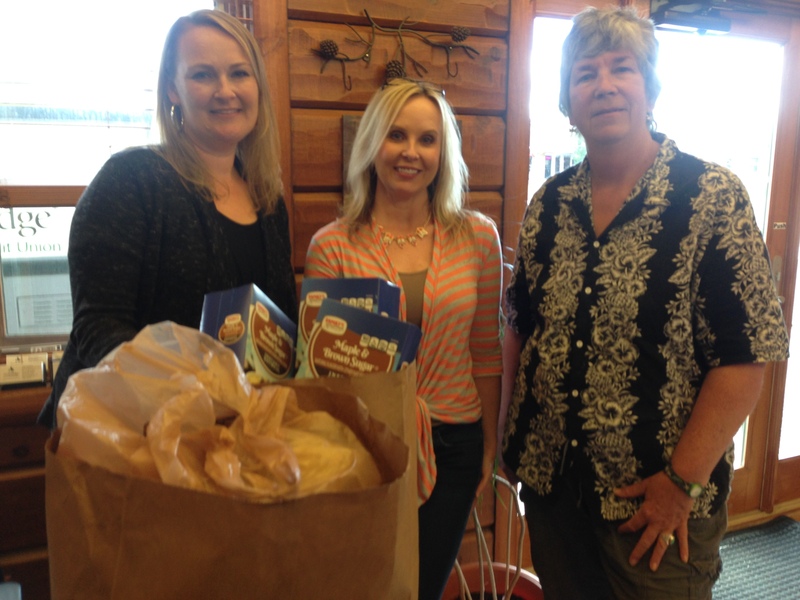 Many NorthRidge members came into the credit union locations to drop off supplies. 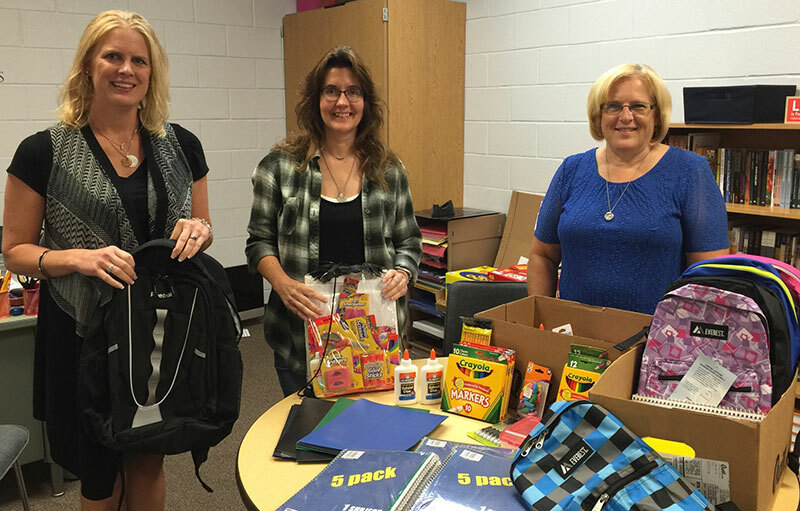 The supplies were delivered to Mesabi East Elementary School Tuesday, September 13. NorthRidge Community Credit Union (NorthRidge) membership continues to expand due to excellent customer service and performance. To meet the growth needs of our expanding membership, we’ve added three full-time member service representatives, and a work study student. The full time member service representatives are Allyson Wolff, Miranda Clark and Christina Huismann, and the work study student is Tia Spielman of Eveleth. Nicholas Mathiowetz, President & CEO of NorthRidge, is excited for these staffing additions. 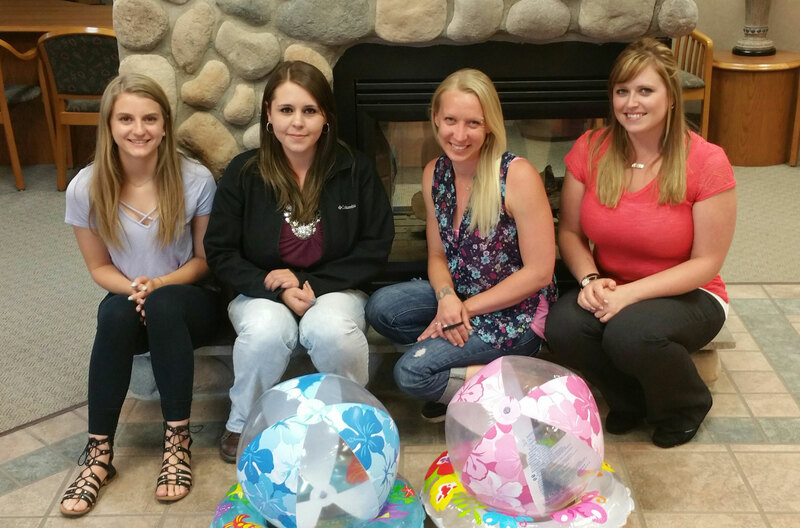 “Allyson, Miranda and Christina all have strong customer service skills and we believe they will be tremendous assets to our team. Tia is new to the work force and I am certain that we can provide to her a strong understanding of the importance of the member and how working diligently provides the best outcomes for everyone involved,” he says. Allyson is from Virginia and started at the Virginia office on June 1st. 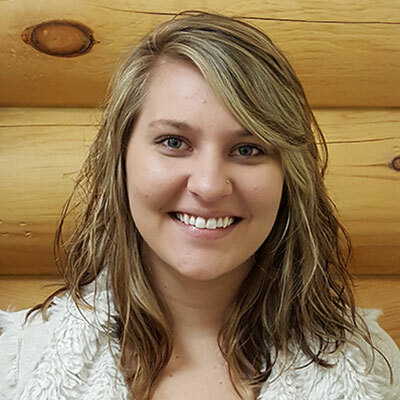 Miranda is from Hoyt Lakes and started at the Hoyt Lakes office on June 8th. Christina is from Gilbert and started at the Biwabik office on June 23rd. Tia started in the Virginia office on June 6th. Please join us in extending best wishes to Doris Kopp, who is retiring from NorthRidge Community Credit Union (NorthRidge). 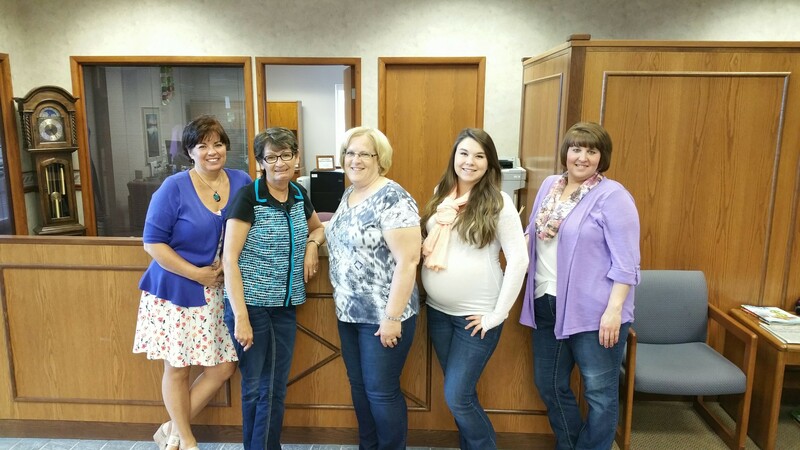 Doris’s last day as a Sr. Financial Service Officer will be June 30, 2016. We will be hosting an Open House Thursday, June 30 for her retirement at our Hoyt Lakes Branch at 283 Kennedy Memorial Drive. We invite the public to stop by from 9:00-12:00 for cake and coffee. Doris has been a dedicated teammate for over 15 years and she has directly contributed to the success of NorthRidge and its members. Doris’ passion for helping our members has been unparalleled and while we all will miss her in the future, we wish her all the best as she spends time with her family and on the golf course. Have a wonderful retirement Doris! We are happy to announce that NorthRidge Community Credit Union (NorthRidge) had a “buzzy” 59th Annual Meeting. Our Annual Meeting is held each year to give a recap of our accomplishments over the year and to share our goals for the coming year. We love to keep our members up to date and involved with our credit union. From May 23-25th we had refreshments and prizes daily, and we loved to see everyone that stopped in and celebrated with us. To conclude our celebrations, we held the annual meeting Wednesday, May 25th at Hoyt Lakes City Council Chambers. Our 2016 Board Nominations were Suzanne Bowman, Dennis Hanson and Mark Larson. During the meeting we recapped 2015 and talked about what we plan to accomplish in 2016. Nicholas Mathiowetz (President and CEO) mentioned new and exciting updates and programs NorthRidge will be adding in 2016. He also talked about a new checking program that will provide a world-class service to our members. NorthRidge looks forward to phenomenal success in 2016. Below is the list of the Annual Meeting Celebration winners and their prizes! We are excited to see what 2016 brings us and all we can accomplish. Make sure to keep up to date with our website and social media to see the new changes as they “buzz” in – follow the hashtag #watchthebuzz on Facebook! All of us at NorthRidge would like to thank all who participated and joined us for the annual meeting this year, and we cant wait to see you again! We fully jumped into our second annual “Fill the Pool” food drive by filling swimming pools at each of our four locations with food for our local food shelves. 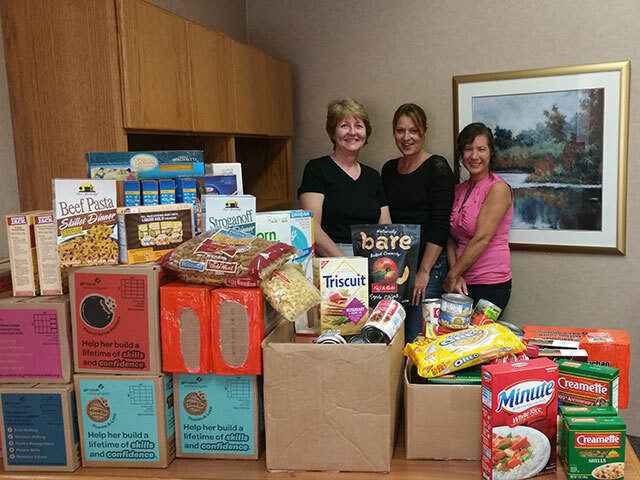 A credit union member sparked this summer drive last year by asking if NorthRidge was currently accepting food shelf donations. 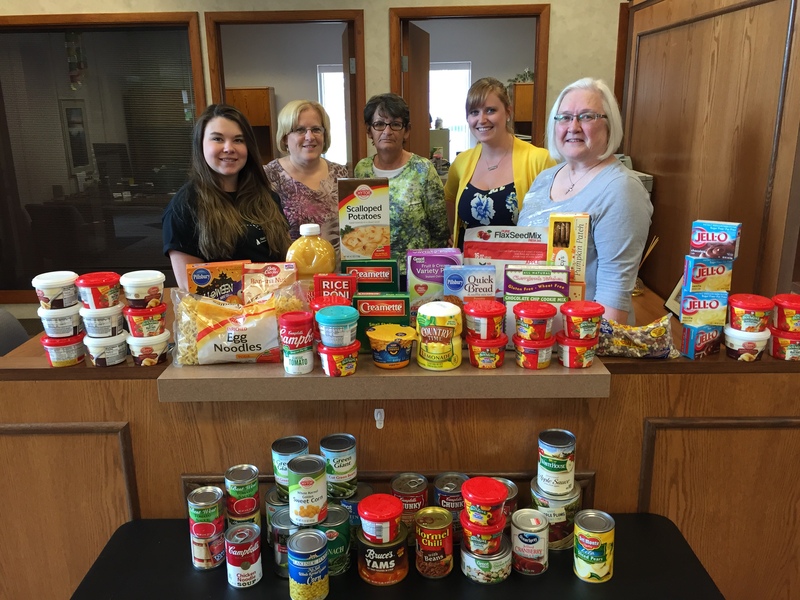 NorthRidge usually holds a food shelf drive in the fall or winter months but decided to hold this summertime drive in the month of June. It has been an overwhelming success for the second year in a row. People have donated bags, boxes and even cases of food. There was more participation than ever imagined and those who have benefited from the food shelf during their lives say they just want to give back. Nicholas Mathiowetz, President and CEO of NorthRidge, says the event would not have been possible without the hard work and efforts of all those involved. “We would like to thank all of our members, friends and family who came out to donate during the Food Drive Challenge. This second year, all of our offices were involved in the food drive and we were able to help people in each of our communities. It’s great to be able to give something back to those in our area.” he said. 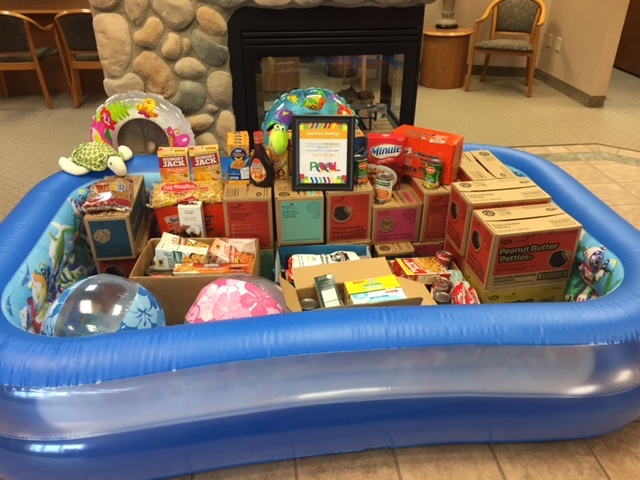 The Fill the Pool Food Drive was started last June by two community-minded credit union employees, Eva and Marissa, at NorthRidge’s Biwabik Office. They, in combination with the rest of the NorthRidge staff, have proven again that NorthRidge truly does live up to the credit union philosophy of people helping people. 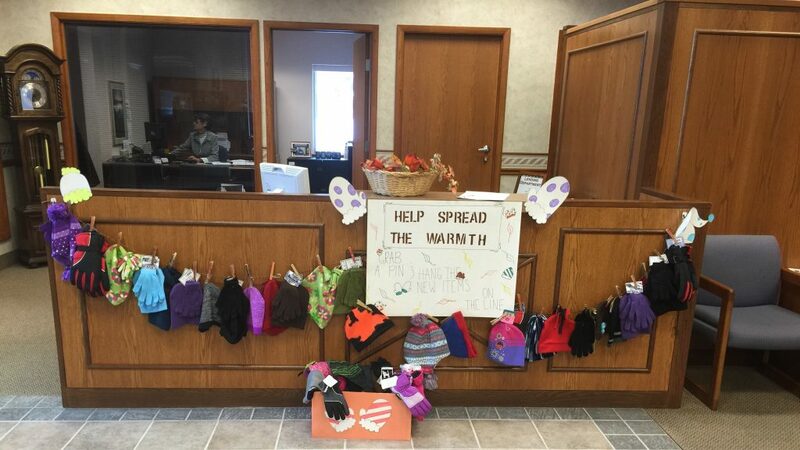 NorthRidge Community Credit Union held a Spread the Warmth hats and mittens drive from October 20 through November 20, 2015. 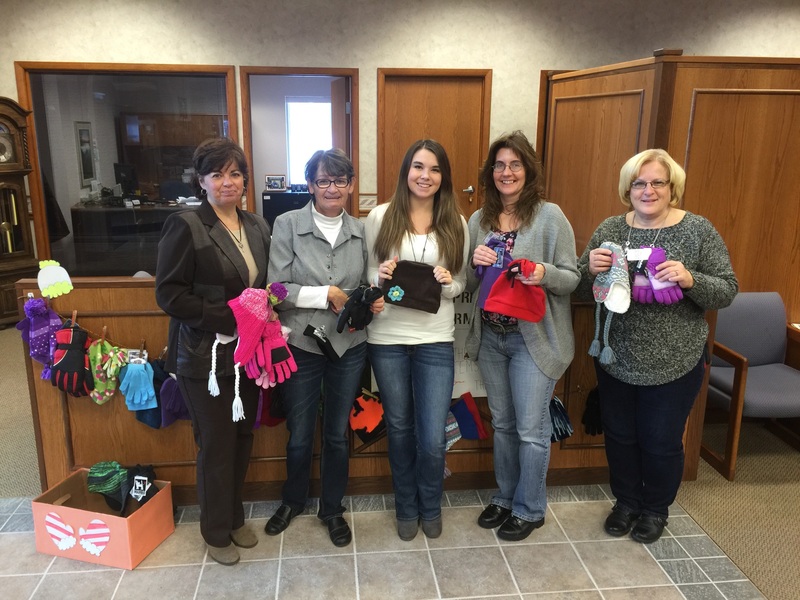 The credit union collected 26 hats and 22 sets of mittens and gloves. 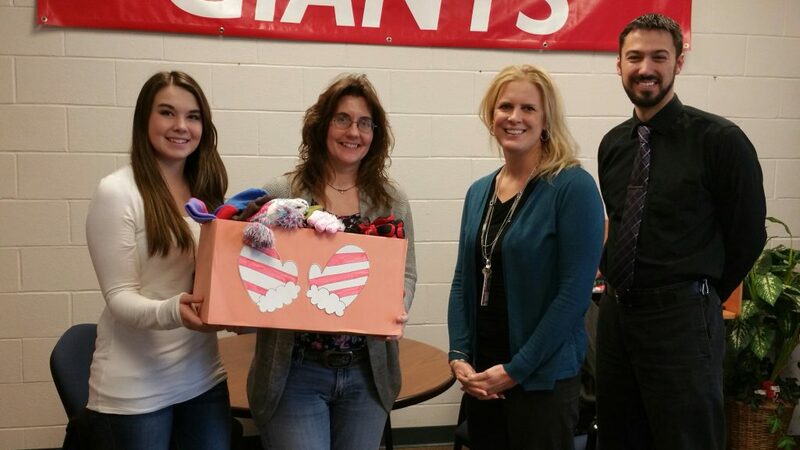 All donations were given to the Mesabi East Elementary School for those who did not have them, and they were delivered just in time for the school’s annual Mitten Run on November 24th! 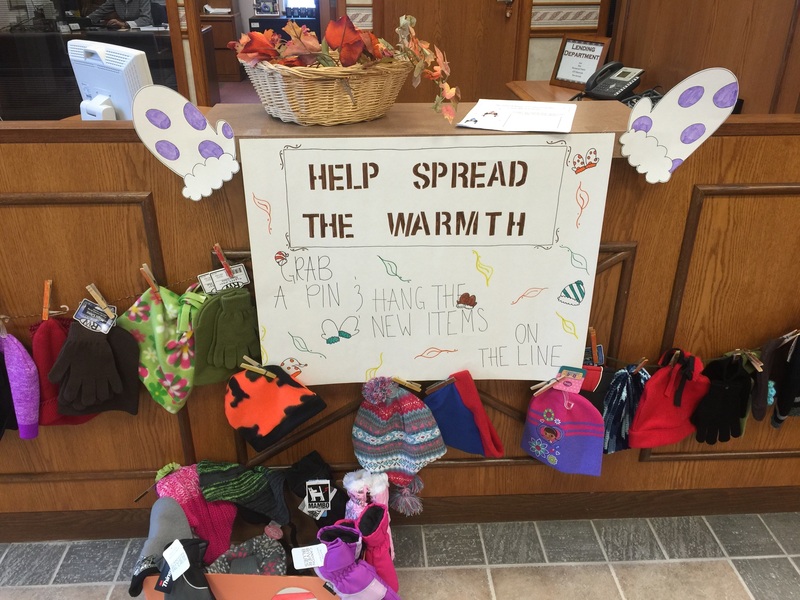 NorthRidge is thankful for all members and employees that donated and helped to Spread the Warmth!